I'm keep on writing my book, no time at all and I'm keep on trying to manage properly with all tasks. PS. Please suggest what would be nice to add, change, remove. + Do anybody have ideas about publishing/publisher(s), thanks in advance? It sounds very ambitious, I hope you are able to handle that workload without buckling. That is actually a really good list. Are you going to break down by individual branding versus business? I guess everybody: person or company makes promotion for business purposes or do I miss something? "Social Media is no magic"
"A guide for Social Media Magicians"
It looks excellent so far. My only question, and maybe I missed it, is whether you are going to write about personal accounts and/or business accounts? I think it's important to break them both down and separate the content. Just me though. Keep up the great job! I respect you for moving forward to write a book. I'm sure it isn't easy. Thanks Steven. I realize deference between personal and business accounts, I'm co-founder of a studio, so got both types of accounts. So I guess I'll describe personal and business account key features on examples/cases. Looks good! All the social networking tools in one go. Sounds good, lots of work. Sounds impressive! 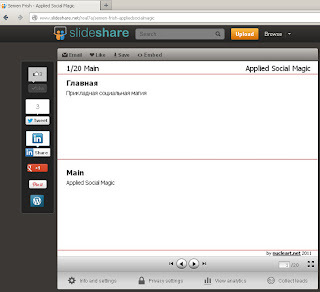 How about a section on mobile social media tools. Keep on trucking. I'm behind your pushing you on! This is worth while so buckle down and getter done! Stay positive and focused. Accomplish anything. I sincerely admire you for writing a book! What an ambitious goal! Looks good.. You seem to have missed off Instagram and I would imagine that Vine could be quite cool for gaming social media. As it looks like you are writing the book in Russian and English it might be a good idea to include VKontakt in there. I would also think about having a chapter on Hangouts. I keep off using #socialmedia on mobile still, so no Instagram and Foursquare I know I should and trying to keep some offline time for me. Vine haven't tied yet and good idea it's trending, thanks. Russian was for conference, so English only and I'm not using Vkontakte and Odnoklassniki, so I wouldn't cover those networks. Hangouds must be useful to, haven't tried yet too. Thanks Justin for support and ideas!